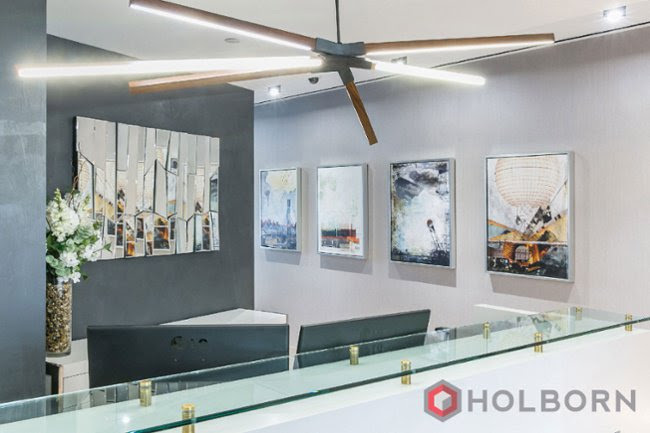 When Holborn Corporation, an independent reinsurance brokerage firm, moved to their new headquarters in Manhattan’s Financial District last year, finding the right art to fill the space quickly turned the project into a challenge. Eventually, the Holborn team found TurningArt and leveraged the service to find artwork that beautifully balances the office’s carefully considered interior design. While the space features stunning views of Manhattan, Brooklyn, and the Brooklyn Bridge, the artwork chosen provides a contrasting perspective that juxtaposes the bustle of the city against pieces that highlight natural themes. “Holborn’s office has captivating, panoramic views of the city, so we wanted the artwork to offer a bit of a retreat from the hard lines, steel and concrete of New York. As a result, the selections share a theme of contemporary depictions of nature – seascapes, skies and trees, but with an edge – which offer both a contrast and complement to the view from their window. “Our goal with our selections was to choose work that felt unique, and that everyone could have an experience with. We didn’t want the pieces to be entirely abstract, but we wanted to challenge the viewer with art that wasn’t too predictable. Before we partnered with TurningArt, we were overwhelmed with options and were really hoping for someone to guide us in the right direction. I was also able to utilize TurningArt’s voting feature and easily share their presentations and gallery pages with our CEO and other decision-makers, which further streamlined the process.